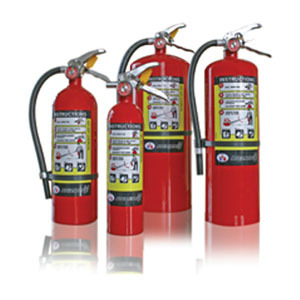 Portable Fire Extinguishers include all classifications of extinguishers and wheeled units. Common Materials such a Paper, Wood or most other combustibles. Flammable Liquids such as Gasoline, Paint Remover or Grease. Required once every 12 years, the extinguisher is discharged and pressurized with water to check the integrity of the cylinder. Every 6 years, all portable fire extinguishers shall be discharged, cleaned and recharged. Required once a year and recorded on a tag attached to the extinguisher.